The idea is simple. Swap out your back tire with a new one that integrates a battery and motor into the hub, which can then power or assist you as you ride. The battery automatically recharges as you pedal. Add in some slick electronics that wirelessly connect with a smart phone, and you’ve got power (and loads of data) at your fingertips. 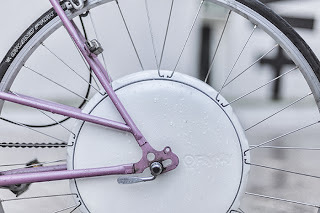 Battery-powered electric bicycles (or e-bikes), such as those produced by Evelo Electric Bicycles, have been around for a while, but this approach represents a significant innovation in design. What’s interesting is that not one, but two different start-up companies are set to release their versions of this technology in the coming months. 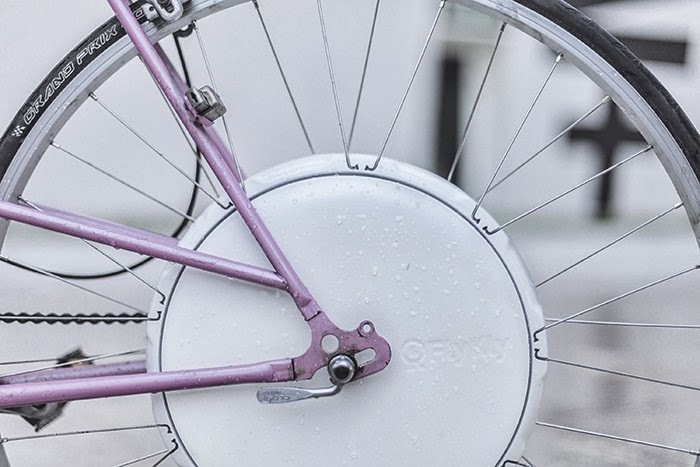 The first is the FlyKly Smart Wheel, a Kickstarter project that has successfully met its initial funding goal. The wheel integrates with the FlyKly smart phone app, which allows you to set your desired top speed; monitor your speed, distance traveled, and battery life; and for anti-theft purposes, remotely lock the wheel’s motor and track its location. Once fully charged—either by plugging it into a socket or by traveling above the set speed, riding downhill, or pedaling with the motor off—the battery has a listed range of 30 miles and a top speed of 20 miles per hour. It weighs nine pounds. The second is the Copenhagen Wheel, which was developed as a student project in the MIT SENSEable City Lab. It’s been in the news the past couple days—including stories in the Boston Globe and New York Times—because the Cambridge, Mass.-based start-up company that sprang from this project (Superpedestrian) just received $2.1 million in venture capital funding. Just like the FlyKly, it features an integrated motor and rechargeable battery in the hub, plus electronics that wirelessly connect to a smart phone to offer essentially the same functionality of the FlyKly (pedal assist, speed, distance, remote wheel lock, etc.). It even looks uncannily similar to the FlyKly and weighs almost the same (9.5 pounds). What’s different is that in addition to recharging from pedaling, the Copenhagen Wheel also recharges from braking. It features an internal three-speed shifting mechanism that can also be controlled via the smart phone. And it has internal sensors that measures the effort cyclists are putting into the pedals—and automatically apply extra power when needed. Interesting stuff indeed, but for me there are a pair of unanswered questions that would have significant implications for my final review. First, neither company provides any information for how quickly or effectively their wheels charge solely from pedaling and braking. Being able to avoid the inconvenience of having to plug in regularly would be a big plus. Second, it’s unclear to me how easy it is (or whether it’s even possible) to swap out these wheels on multi-gear bikes. It appears that they are largely designed for single-speed designs (especially the Copenhagen Wheel). Given that I (and many others) ride multi-gear bikes with beefy nine-gear cassettes on the back wheel, this seems like a rather crucial detail. Tech can be cool, but ultimately—whether it’s by e-bike, smart wheel, or good-old fashioned leg power—just pedal on people!